Thanks to a recently launched video service by the Pro Football Hall of Fame, gridiron fans were able to watch live an event that few will ever see in person: the Merlin Olsen Super Bowl luncheon. The Hall of Fame debuted its online video channel Friday and led off with a lavishly produced live stream of the 13th annual event. The two-hour stream honored former Minnesota Vikings coach Bud Grant and the Wilf family, owner of the Vikings, all captured through a five-camera production. The highlight, though, was the enshrinement of new Hall of Fame members. Archived footage, original programming, and events are available on demand on the Pro Football Hall of Fame’s new online channel. “At this luncheon, by the way, I’ve got 51 Hall of Famers and 21 legends in a room of 750 people. It’s the largest gathering of any like this at the Super Bowl,” says George Veras, COO/executive producer, Pro Football Hall of Fame. Super Bowl Weekend was the ideal time for the channel’s kickoff. Veras and his crew worked for three years to prepare for the date, digitizing much of the HOF’s archives and experimenting with streaming-video platforms. The channel launches with around 350 hours of content, all available on demand. Fans can see original shows, live and recorded events, HOF enshrinement speeches, and digitized photos and documents. The channel has multiple original series and documentaries currently in production. Undercover Bust is the HOF’s take on Undercover Boss. In it, kicker Morten Andersen pretends to be a HOF volunteer and walks people through the center’s bust room. The show Football’s Greatest Rivalries examines the grudges that give fans something to root against, starting with Washington Redskins vs. the Dallas Cowboys. Other originals include Hall of Fame City and a 15- to 18-hour documentary called 100 Yards of Football, a Century of Character. The Hall of Fame keeps busy during the year with 600 national appearances, and some of those will turn into live programming for the channel. Veras is surprised by the level of interest in these events, noting that the HOF live-streamed the recent U.S. Army Award of Excellence presentation on its Facebook account and attracted more than 30,000 viewers. To help give its events some professional polish, a year and a half ago, the Hall of Fame partnered with Livestream, which provides technical support for the channel — for example, for the five-camera luncheon — and also trains HOF staffers on live video production so that they can run their own production equipment. 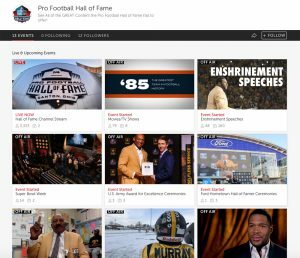 The Hall of Fame’s live-streaming efforts preceded the channel launch by more than a year because the organization has been experimenting with Facebook and Twitter streaming, testing viewer response. It created a daily series of two-minute videos called The Pro Football Hall of Fame Today, celebrating great achievements and showing off newly digitized pieces in its collection. The series has been a hit, helping the HOF grow traffic on its social channels. For Veras, the biggest lesson in the HOF’s Facebook efforts was the importance of promotion. Or, as he says it, “promotion, promotion, promotion, promotion, promotion.” That means using social tools effectively so that fans know what’s taking place, piggybacking on other news stories to help promote an event, and being smart about highlighting exclusive content. He’s also learned the importance of offering a professional-quality product, which is why the HOF works with Livestream. Now that the channel is live, Veras will let the fans decide where to take it next. He’ll monitor viewer sentiment and viewing activity to see what fans like to watch and where else they want to watch it. Sponsorships will eventually help monetize the channel, but that’s not part of it yet. Although the Super Bowl launch was a significant milestone for the Hall of Fame, it’s eyeing an even bigger date two years ahead. In 2020, the NFL will celebrate the 100th anniversary of its founding, and the HOF has a lot planned to mark the occasion. Besides opening the Johnson Controls Hall of Fame Village, a major new attraction in Canton, OH, the channel will live-stream multiple talks and celebrations reflecting on 100 years of history.